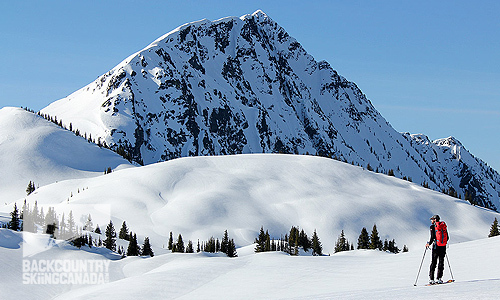 It was early May when I geared up for a weeklong ski touring trip into Kokanee Glacier Provincial Park and I was still very new to the scene. After boxing up a week worth of groceries and triple checking I had everything I would need, I made my way down to Nelson BC’s Kootenay Valley Helicopters for a briefing on the safety around their machines. Being unseasonably warm at the time, the group of us looked ridiculously overdressed in ski/snowboard boots and winter gear. We were only a twenty-minute flight as the crow flies to our destination, and nothing but vast wilderness separates Kokanee Glacier Cabin from the nearest town, so precautions must be taken. 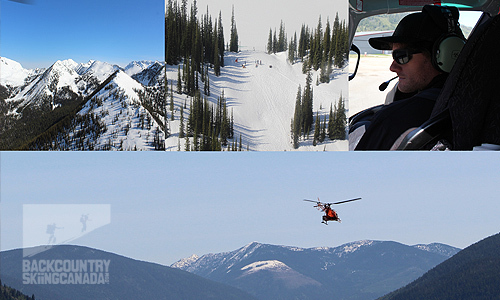 Kootenay Valley Helicopters own an impressive fleet to transport over equally impressive vistas. Arriving at the Kokanee Glacier Cabin landing pad we were greeted by the group who had occupied the cabin the week previous, a posse of 60+ year olds who had been making the trip annually for 20 years. 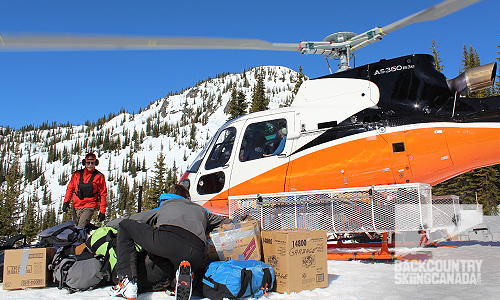 Quick pleasantries were exchanged as we unloaded and loaded each other’s gear while the helicopter blades roared above. Before the last heli shuttle we cheekily promised to keep their secret from powder hounds & backcountry enthusiasts who might lower the lottery odds for future winters. Due to enormous popularity of the area in peak powder season, a lottery was established to keep odds fair to potential future visitors. Only 12 guests per week are allowed at the cabin, and weather permitting, helicopter flights make the exchange each Saturday. Kevin Giles, KGC Caretaker, walks around KVH’s A-Star as Brad ensures supplies are secure. Once the helicopter departs, Kevin Giles introduces himself as the Cabin’s caretaker and gives us a tour of our home for the week. As we settle in, we discuss the amenities and go over safety precautions before choosing our beds. Within an hour we’ve got our skins on and are off to explore the surrounding wilderness. Our first day out provided sunshine and beautiful views of the park. In 1896 Smuggler Mining Co built a cabin roughly 15km west of Kootenay Lake and the Dickenson Mine was established. Roughneck miners spent years collecting silver and other valuable minerals while using the small cabin for shelter. The Slocan Chief wasn’t more then 22ft x 18ft and housed the miners and their tools. 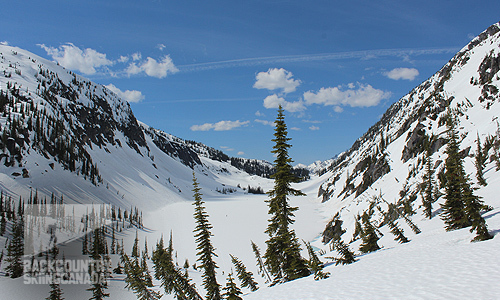 In 1922 Kokanee Glacier Provincial Park was established and a community of outdoor enthusiasts would volunteer their time and efforts into protecting the land and maintaining services. In 1960 Parks Canada saw the cabin as unsafe and made plans to demolish it. If it weren’t for a dedicated community of backwoods enthusiasts the Slocan Chief may have fallen, but volunteers hiked building materials and supplies into the park to refurbish and renew its structural integrity. The addition of a sleeping loft and an outhouse made it possible for groups to stay & ski for days. 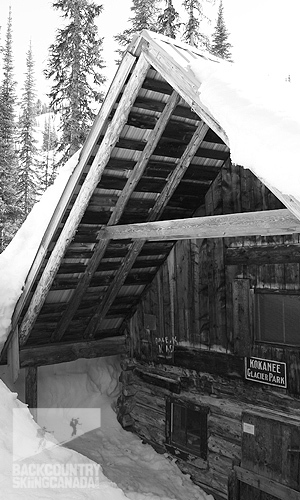 An A-frame cabin was constructed nearby to house a park ranger who would assist in mountain safety, guiding and story telling. The Slocan Chief Cabin was once the only shelter in the park. 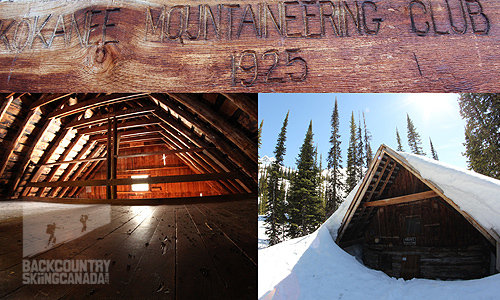 Preserved as a museum, now paying homage to past miners and skiers of Kokanee Glacier. 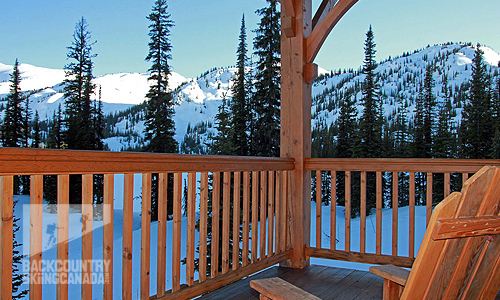 For many years, skiers and split boarders marveled in the endless terrain and epic views surrounding the cabin. 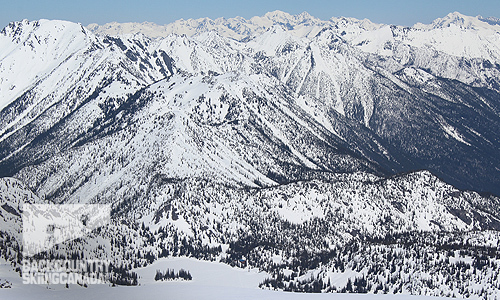 I spent one of my down days reading the guest book of the Slocan Chief and visualized the stories of deep powder, long runs and fresh turns that were so cherishingly described, page after page, by people of all ages, backgrounds and professions. While stories of blue bird powder days and unforgettable skiing experiences filled the pages, so to did the odd story of avalanches, injury and death. Stories written with caution and detail, to pass on any valuable information to the next groups who could be in similar risk. In December of 1998 at the age of 23, Michel Trudeau (son of former Canadian Prime Minister Pierre Trudeau) was ski touring with some friends along Kokanee Lake when an avalanche crashed down the massive rock walls and swept him into the lake. While his friends managed to escape, Michel did not and his body was never recovered. A grieving Tredeau family made efforts to prevent similar accidents from happening through backcountry awareness and avalanche safety. Kokanee Lake: The site of Michel Trudeau’s fatal encounter with an avalanche that released well above what can be seen from below. We crossed one at a time, “as fast as you can go without stopping”. 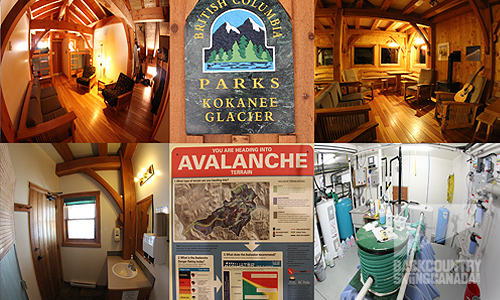 In 2002, with the donations and volunteers to the tune of $1M, Kokanee Glacier Cabin was constructed. Since the cabin opened in 2003 the Canadian Avalanche Association has hosted many educational courses for future industry professionals. Each group that stays at the cabin is subjected to a snow safety presentation from the caretaker and is encouraged to practice skills in the beacon basin and review backcountry travel techniques. 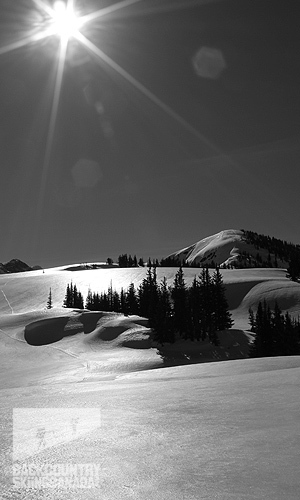 While submerged this deep in the backcountry, the weeklong Kokanee Glacier Cabin experience facilitates and maintains a learning environment for ongoing development of backcountry education, no matter what level of expertise. As my SROAM instructor’s have always stressed, “there is always something new to learn in the backcountry”. Grey’s Peak (2753m) is the highest point within the park boundaries. Named after war hero, pilot and Nelson native Lieutenant Robert Hampton “Hammy” Grey. 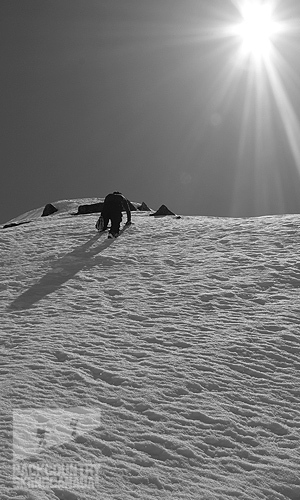 Brad ensures a safe hold as he summits the snowy peak. 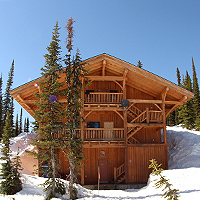 Kokanee Glacier Cabin is a self-sustaining backcountry lodge that has the luxury and comfort of home. It is fully equipped with hydro electricity, sewage treatment, gear drying room, clean running water, a fully furnished kitchen with 2 large sinks, 2 stove/ovens, a fridge, fireplace, 2 bathrooms with flush toilets and a self contained apartment for a caretaker with his own amenities. The sleeping quarters for guests house about 25 people, but only 12 are permitted in the winter/spring: meaning lots of room and more fresh lines to be had! In preserving some of the backcountry lodge experience, a shower stall holds a water bag that you can fill in the kitchen sink. This keeps water waste low while keeping guests from stinking up the place. The extremely comfortable interior includes all amenities expected from a luxury chalet and is self sustaining with sewage treatment and potable water systems. Avalanche & backcountry safety materials line the walls with access to topography maps and weather updates. 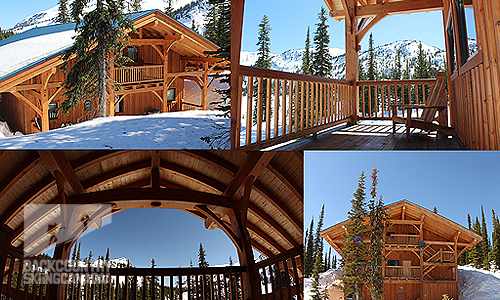 Kokanee Glacier Cabin’s beautiful timber frame sits on Kaslo Lake & accommodates backcountry users in the winter, spring and summer. Regardless of getting into the cabin at peak powder season or the middle of spring, I can assure anyone that his or her backcountry itch will be scratched. One week is more then enough time to explore to your heart’s desire, take in amazing views that stretch as far as the eye can see and experience incredible terrain. 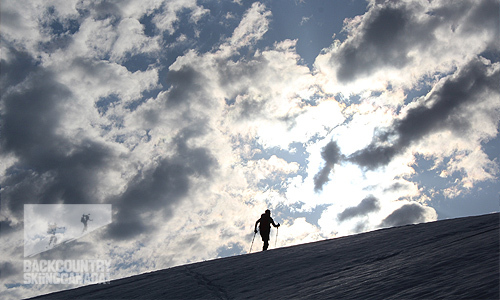 The winter’s deep powder will test your leg strength during short days, while spring offers lengthy endurance trips from sunrise to sunset. Early morning starts grantees beautiful sunrises and maximizes travel time. 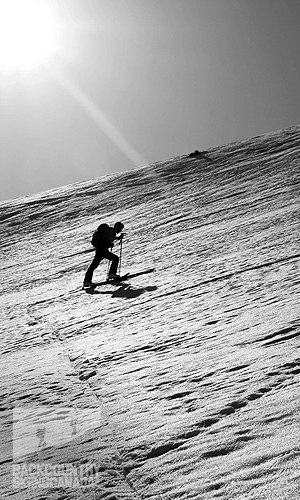 Climbing is only half the fun; route selection, snow science, punishing ups. But don’t forget to have fun on the way down! Inside the cabin in the evening hours, caretaker and former park ranger Kevin Giles will entertain with history lessons about park development, war stories of the powder militia and stories about the park’s unforgiving forces of nature. Truly one of the most inspirational and knowledgeable people I have met. Kevin spends the majority of his winter with the rotating company of backcountry skiers and snowboarders from all over, feeding off of and contributing to guest atmosphere and excitement of their week vacation. 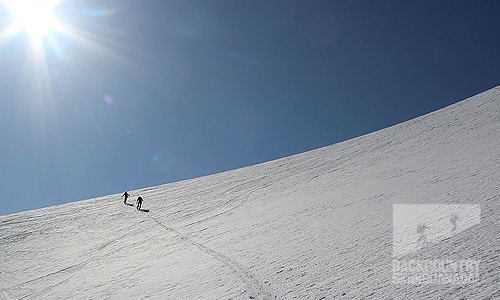 Although we experienced warmer then seasonal temperatures for the week in early May, adventure still awaited us upon peaks and routes to and from. 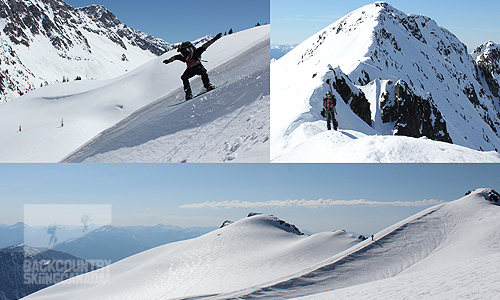 Cloudless skies, still air and a view as far as the eye could see were our summit rewards. 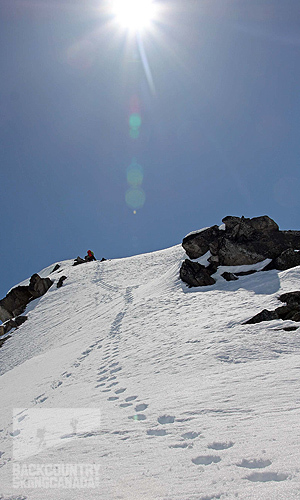 Our consummation of terrain and numerous summited peaks compensated for our lack of Kootenay Powder that is typical in the area, but spring mountaineering and corn snow is a great way to close out the ski season. 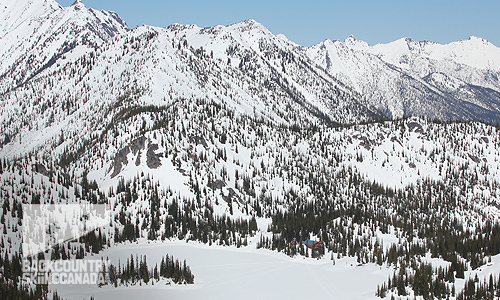 A view of Kokanee Glacier Cabin on the edge of Kaslo Lake. Photo taken from Mt. John Carter. 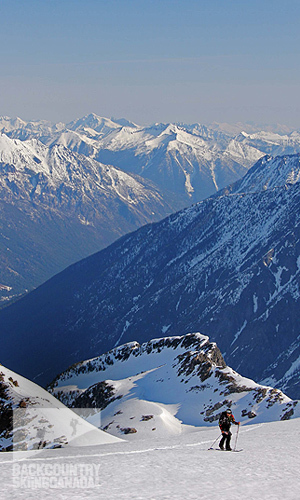 Named after former president of the Friends of West Kootenay Parks Society who was killed in an avalanche in 1996. 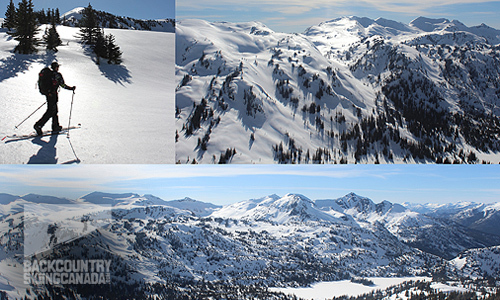 - Surrounded by epic terrain & endless views. 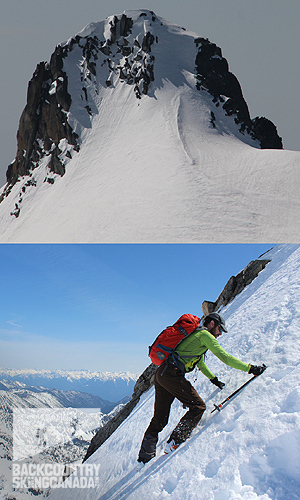 - Access to backcountry safety & avalanche information/materials. - Hydro Electric, Sewage Treatment, Potable Water, Hot Water. - Full Kitchen with electric & gas stoves, cooking supplies & sinks. - Flush toilets, shower stall with shower bag. - Gas fireplace, electric baseboard heaters. - Comfortable living space with board games and books. - Caretaker with private quarters. - Spacious sleeping quarters provided with sleeping pads. - Gear drying room with gas fireplace. - Backup propane & outhouse available. - Satellite phone & internet available for emergencies. 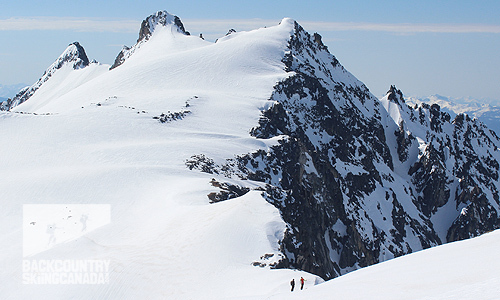 - One week in majestic backcountry wilderness. - Snowmobiles/Heli Skiing is prohibited. - Forget something? The caretaker likely has you covered! - Arrival/Departure is weather dependent. - Lottery System doesn’t guarantee reservation. - Glaciers (Woodbury, Cariboo & Kokanee) are all receding. - All payments 100% non-refundable once processed. This is only our opinion. Do you disagree? Did we miss something? Are we totally out to lunch? Join the discussion in the forums here, and let us know what you think. People like/dislike lodges for different reasons so chime in and we'll get a well-rounded evaluation. Some additional photos and a video below for your enjoyment.